Vitamin E is an essential vitamin and powerful antioxidant that helps protect cells from free radical damage and enhances the antioxidant activity of molecules. 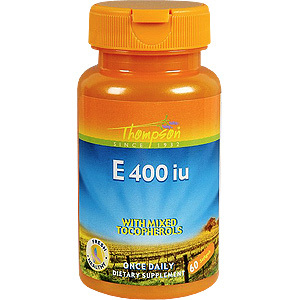 The all natural Vitamin E dalphatocopherol with mixed tocopherols selected by Thompson is the most biologically active form of Vitamin E available. As a dietary supplement, take one softgel up to two times daily. 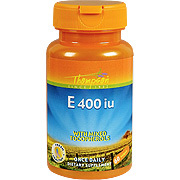 Vitamin E 400 IU with Mixed Tocopherols is shipped in a discrete, unmarked package. Orders are processed immediately and usually take about 3 to 5 working days to be received. We do ask that you try it for 2 to 3 weeks to feel the full effects. Any information received is used only for order processing and shipping purposes. Your information, such as e-mail address, will never be disclosed to a third party.